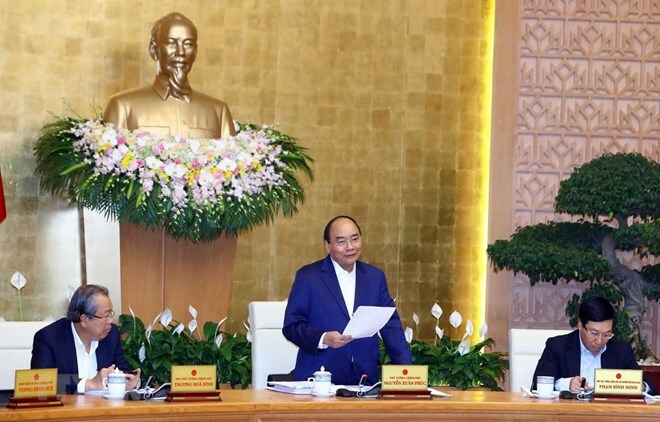 Hanoi (VNA) - Ministries, sectors, localities, economic corporations and State-run companies have been requested by the Government to work hard to realise social development tasks of in 2019. In the Resolution of the Cabinet’s meeting of March concerning socio-economic development tasks, the Government asked the Ministry of Labour, Invalids and Social Affairs (MoLISA) to devise measures to enhance the quality of vocational training and promote the self-control of vocational training establishments and the granting of vocational certificates. The ministry was requested to coordinate with the Ministry of Education and Training (MoET) to prevent and strictly handle acts of violence and child abuse, and urgently form grassroots child protection networks. Meanwhile, the MoET will be responsible for directing the compilation of new textbooks in line with the roadmap approved by the National Assembly, preventing wrongdoings in the national high school exams, ensuring safety in schools and strictly handling heads of educational institutions that violate regulations. The Ministry of Culture, Sports and Tourism will have to focus on enhancing tourism promotion in key markets, and to implement solutions to diversify tourism products and improve tourism quality. It is also required to pay attention to policies for football development.